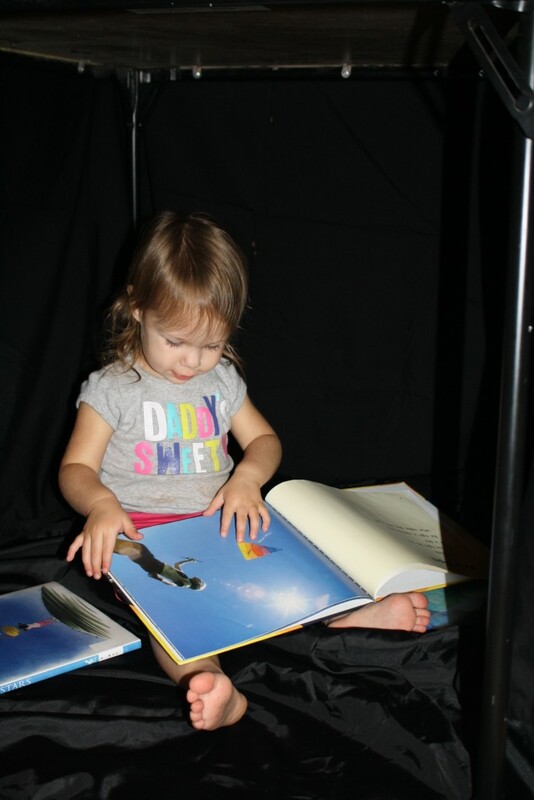 I love to incorporate a new pretend play space or reading area into our themes. In the past we’ve made cardboard jeeps to learn about Africa, a barn to learn about the farm, and a tent rain forest to learn about South America. When I saw this cave of stars from Play At Home Mom LLC and the fibre optic sensory cave from The Imagination Tree I knew I could have a little fun putting something together for our night sky theme. Somehow I forgot to save most of our cardboard from Christmas, so I had to come up with another idea. We have a black card table, so I decided that would work well. I placed a black blanket on the floor and draped a black sheet across the top of the table. At this point Tinker figured out what I was up to, and she was eager to get in there. Honestly I could have left it at that. She LOVED the space already. She sat and read for a while. 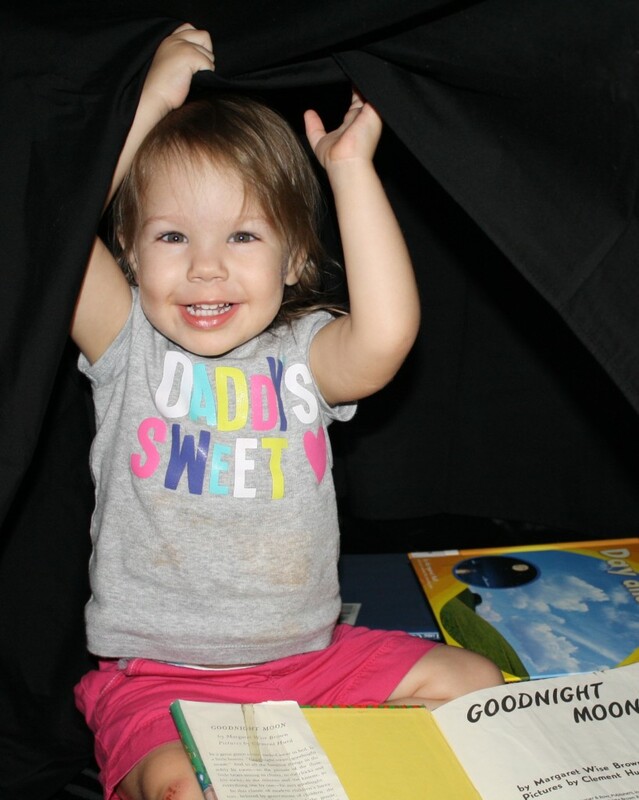 Then she figured out how to pull down the fourth side of the black sheet, and she started playing peek-a-boo. We also played “dark” and “light,” as she opened and closed the sheet. She loved it! My husband and I waited until the girls went to bed to finish the rest of the reading nook so that they would be surprised when they woke up. We had a piece of leftover black car carpet from one of my husband’s recent projects, so we used that. Cardboard would also work well. I just tend to go with the materials we have on hand. We poked holes through the carpet with a screwdriver. There may be a fancy tool that would have worked, but again we use what we have on hand. Then we poked the lights through the holes. This part took the longest, but the whole project only took about 30 minutes. It was well worth it, just to see the look of awe on the girls’ faces. The last step was securing the carpet to the top of the card table. I knew we would only be using this setup for about a week, so I didn’t want to do any gluing or anything that would be long term. Instead we decided to poke holes in the edges of the carpet and used twine to secure it around the table. We tied the four corners to the leg braces underneath the table. Then we poked holes in the middle of each side and looped the twine over the top of the table and all the way around to help prevent sagging. It worked well for our purposes, but I am sure many of you will know of an even better way to secure the carpet. Let me know if you think of something. This was the first place Lovey went in the morning, and she read or played with her toys there many times throughout the week. Please do use caution with the materials you use for this project and supervise kids playing in any space that involves electricity. We talked a lot about real stars being hot, and this helped the kids remember not to touch the “stars” in our reading nook. We also didn’t leave the reading nook on all day. We turned it on for special play times when I could closely watch the kids. 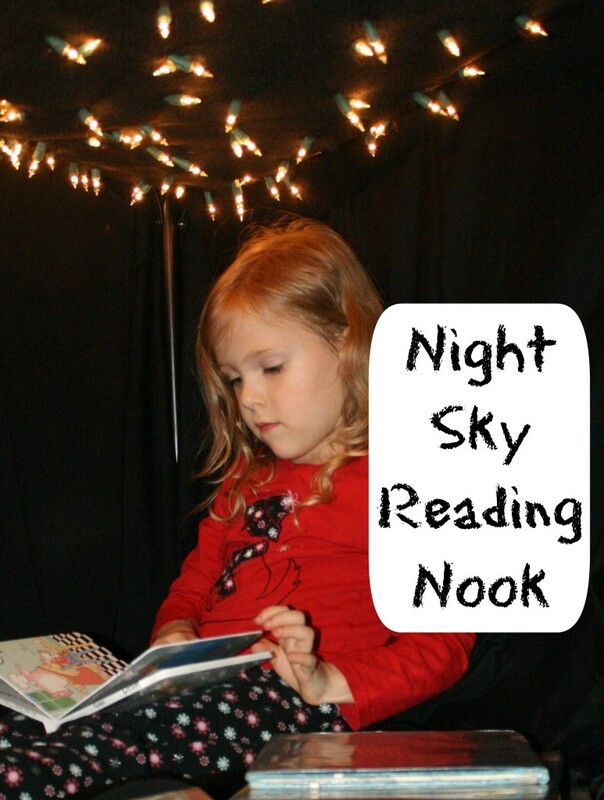 The Amazon widget below contains some of the books we enjoyed reading during our night sky theme. Thanks! I appreciate the invite. I linked up this post, and I’ll check back in the coming weeks to add more. Good luck with the linky! Great idea to inspire children to read. I will have to get the lights out more when we have Fort Day. Thanks for sharing at Mom’s Library! Thanks! Yes, even just adding the lights without making the whole “night sky” would be a wonderful addition to Fort Day. So fun! My kids would love that magical place too. Thanks! We’ve enjoyed it a lot. I know what you mean! I enjoyed snuggling up in there, too. JDaniel is going to want one too. What a great way to explore and enjoy books! I am going to share this post on Pinterest and the Read.Explore.Learn. Facebook page. It really is a cozy little space! I hope you enjoy it. I was thinking next time we might add a few consthttps://www.fantasticfunandlearning.com/wp-admin/edit-comments.php#comments-formellations into our scene. Thanks so much for sharing! Thanks so much! I really need to put together a few posts about some of our other reading areas! Glad you liked this one. 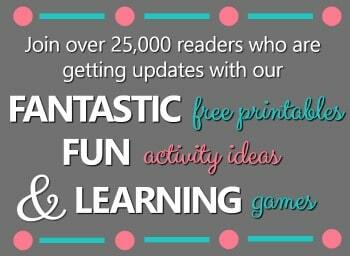 I’m pinning and sharing all over the place too, Shaunna! 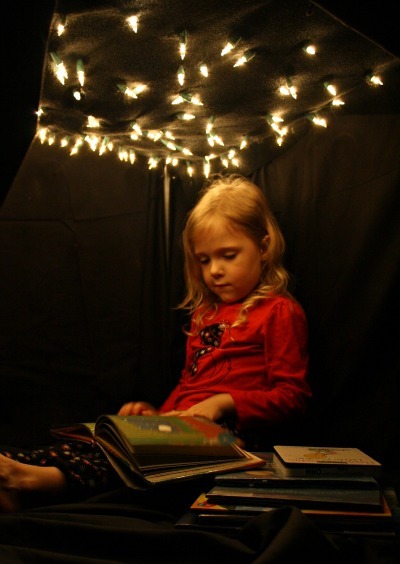 What a magical little reading nook you guys created. Absolutely love it!! Thanks so much, Ann! It’s definitely the most popular spot in the house right now. What a fun idea! The lights make it so magical. Sheesh, I’d read in there! I would, too! Honestly if I knew it was going to be so cozy I might have used a bigger space like underneath our dining room table…but I thought we might want to eat dinner this week 😉 Maybe next time we will just sit on the floor and have dinner under the stars! I LOVE this! This would have been great for our Goodnight Moon unit. We’ll have to work it in sometime in the future! Pinning and sharing all over the place. Thanks for the idea! Thank you! I thought the same thing when I saw your Goodnight Moon unit. I think it would be fun with an outer space theme too…maybe make some planets or rockets to go with it. Lots of possibilities! 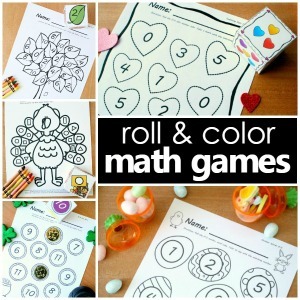 Thanks so much for pinning and sharing, too!